I don’t even know where to begin with all that has been going down around this place. 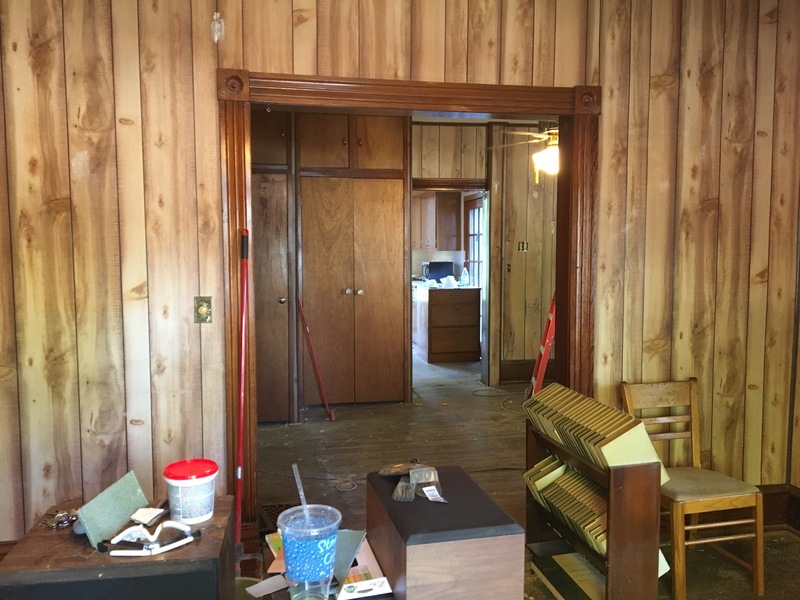 We have been working HARD doing things like pouring porch footings, scrubbing tobacco residue off of popcorn ceiling, tearing up carpeting, pulling thousands of staples and throwing away piles of trash. My mind spins all day long, trying to prioritize and balance our housing deadlines with my 2 other jobs, and my 3 kids. My body aches at night, and I have lost weight, I think because there isn’t as much time to eat. This has been rough. It has also been fun. Little by little, we are loving these houses back to life. A month ago, we started preparing the first level of Old School for a renter. This was the level that the old man had lived in since ~1965. When he moved in, he did a lot of renovations. Then for the next 50 years, he did nothing. The first thing we did… tear up the red carpet. It was everywhere- including the bathroom and kitchen. The family had cleared out most of his belongings, but there was plenty left for us. 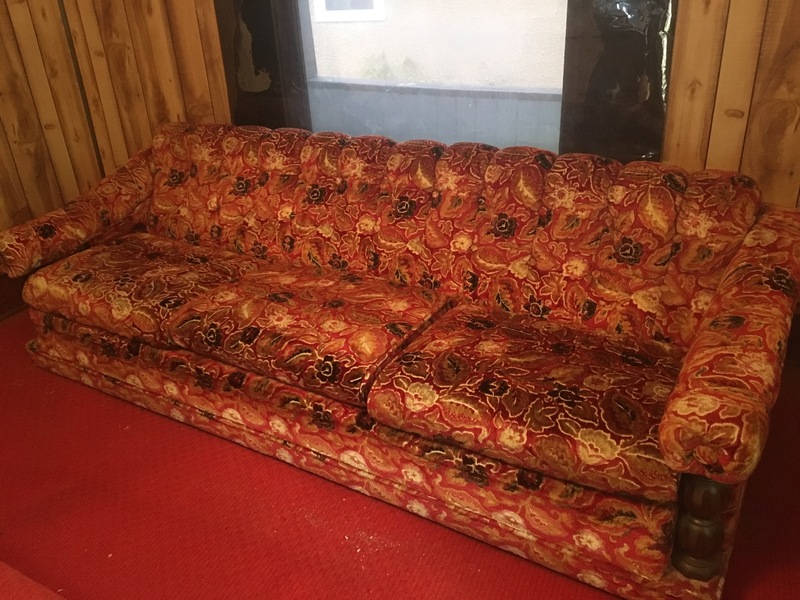 Including this lovely couch. Our neighbors, who one a cool record store, took this off our hands. The entry way. We were happy to find black linoleum underneath the carpet. We are going to clean it up and leave it. 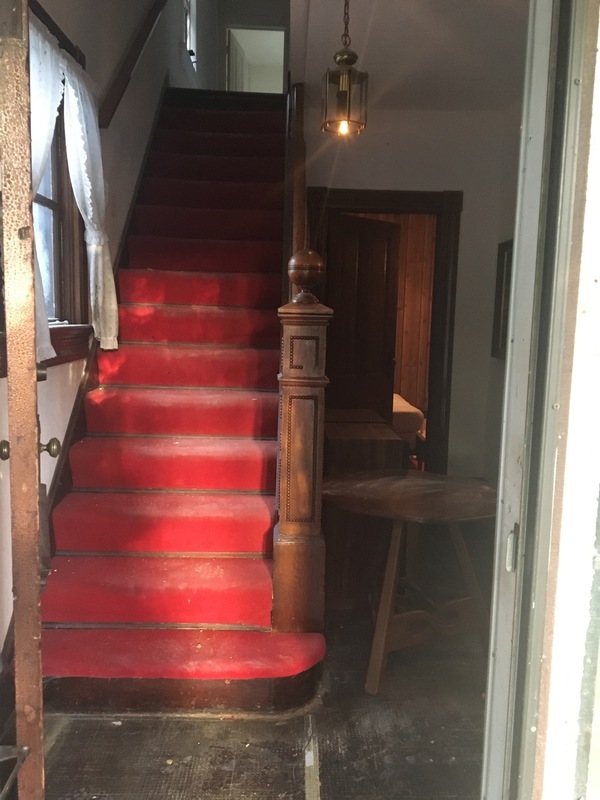 This room will also see refinished stairs, new paint and a new light fixture. 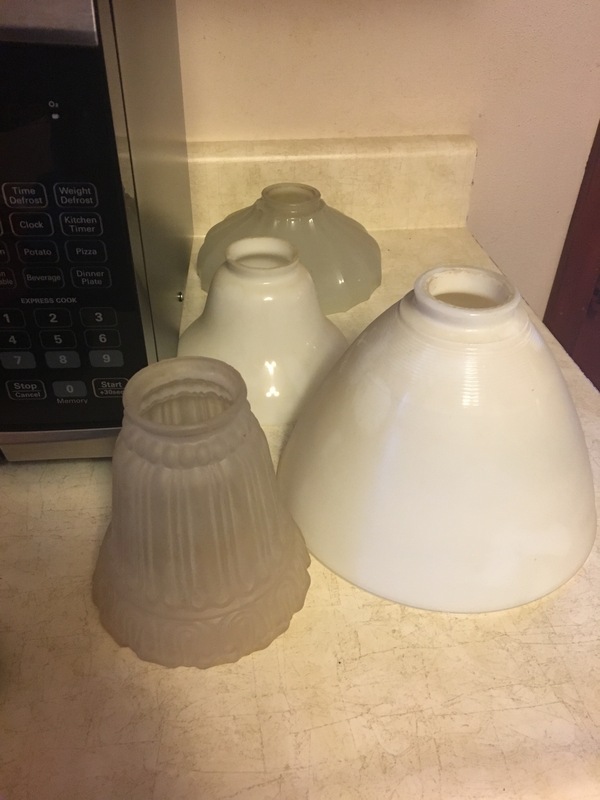 Finding these light shades in the kitchen cupboards was a happy surprise! 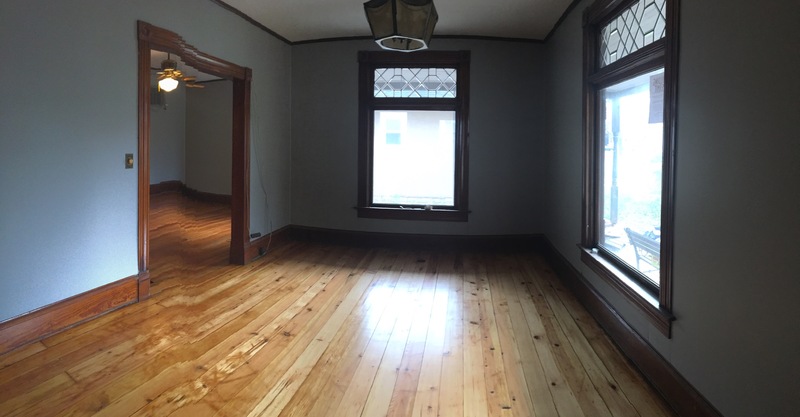 We were thrilled to find the plank fir floors were in incredible shape. In the kitchen, they were completely raw- had never seen a coat of stain or wax. 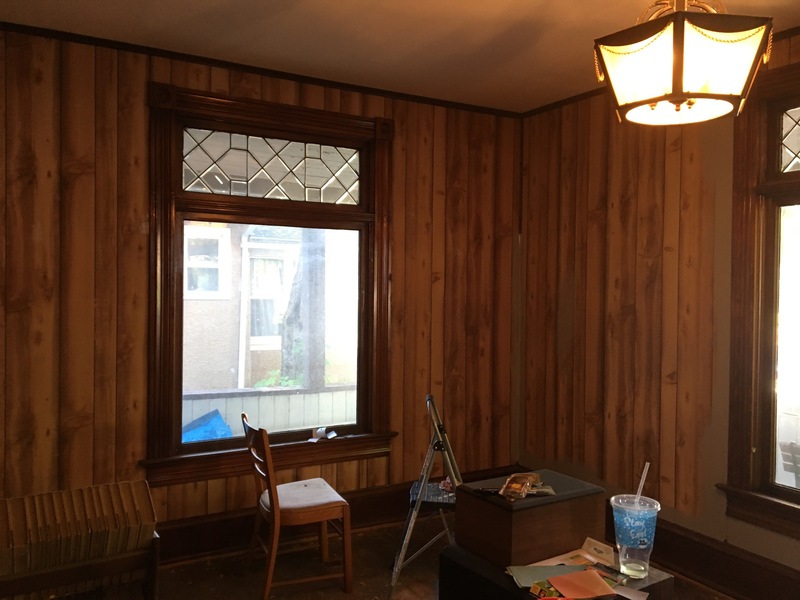 Next we painted the faux wood paneling. 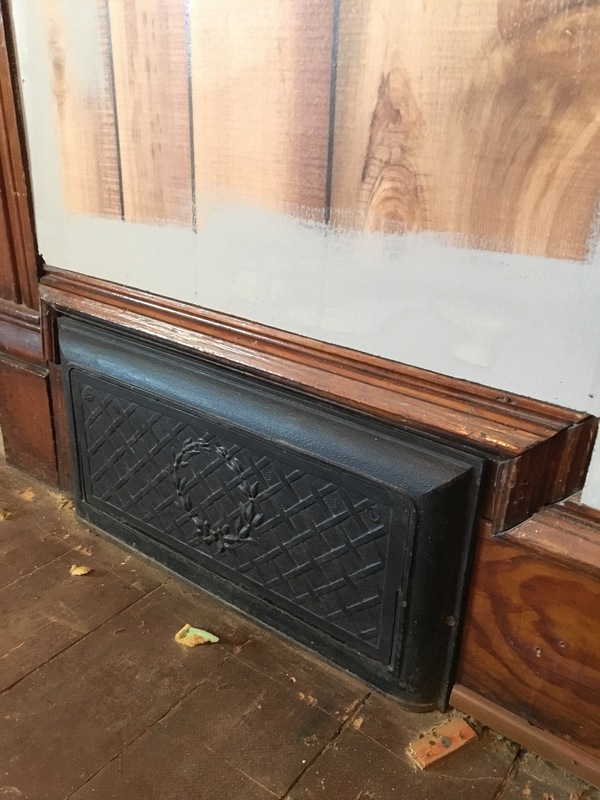 We don’t have time to see what is underneath… for now, the paneling stays. The color we chose is “Dorian Grey” by Sherwin Williams. PS- check out these vent covers!!! Could the paneling be doing any LESS for these windows? In other news, I lugged my vacuum upstairs one day and realized I COULD NOT vacuum the ugly stained shag carpeting one more time. 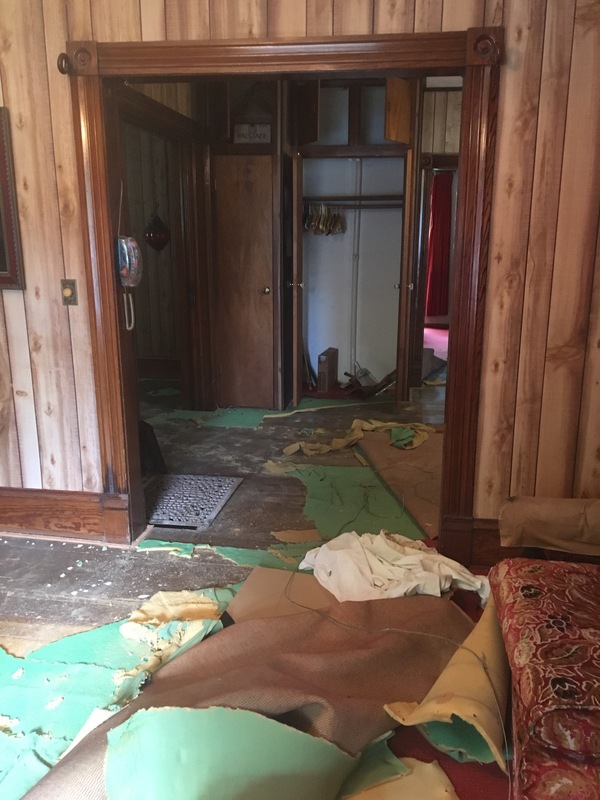 My husband had told be to absolutely NOT tear up the carpeting until we had time to address the mess that was likely to be under it. I considered this. Then I just tore up one tiny corner to see what was underneath. Then I tore it all up. Is it in rough shape? Kind of. Is it better than the carpeting? ABSOLUTELY. 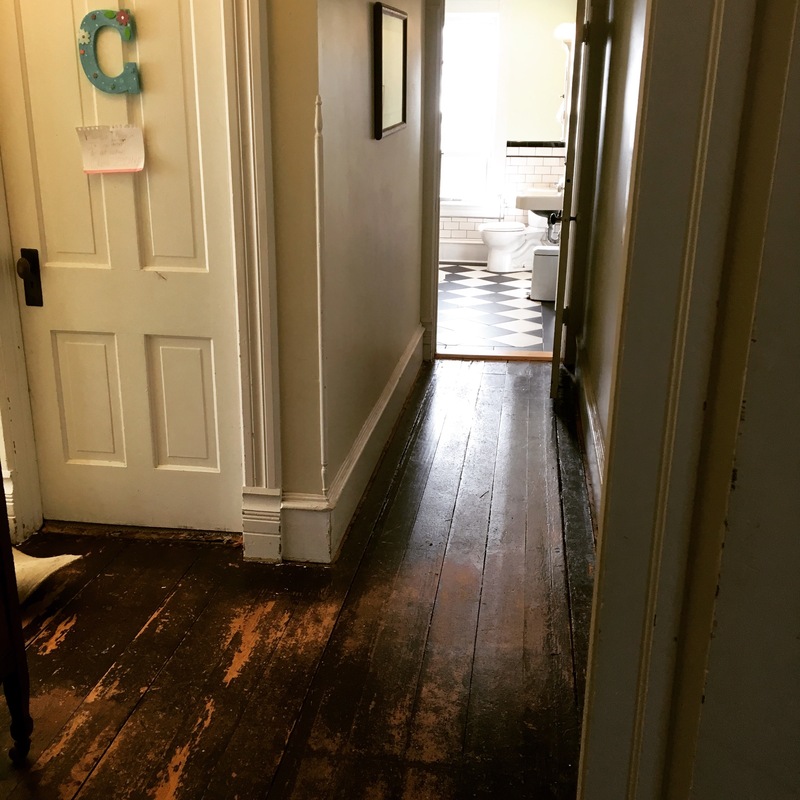 Back at Old School, we indulged ourselves in the luxury of paying someone to refinish the wood floors (this is getting EXCITING!) 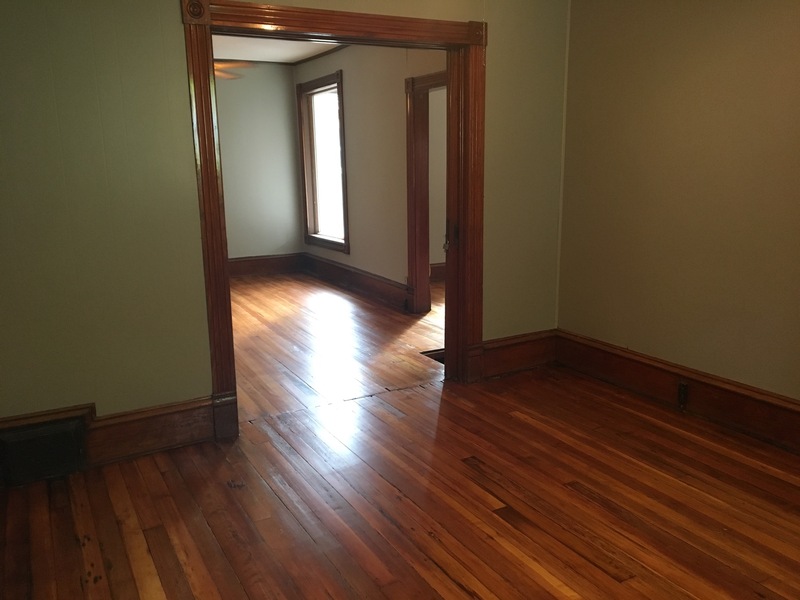 Note: the main entry living room has wider planks than all of the other rooms (even the kitchen and bedrooms). WHY?? The apartment this afternoon. Isn’t it lovely? Don’t you want to move right in? 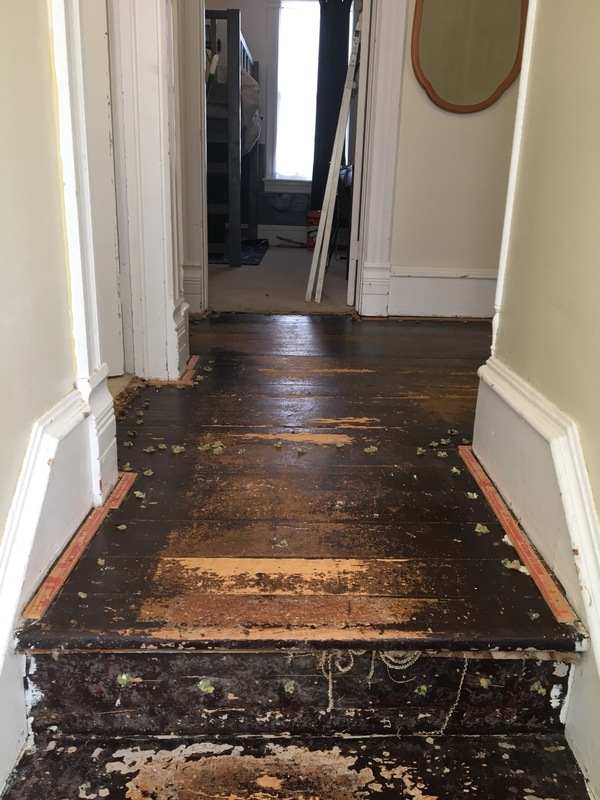 PS- if you are tired of waiting for me to post updates on all of our rehab schenanigans, you can “like” my facebook page- “The Harrison Delong House.” I usually post updates there a couple times a week! That’s looking great! I really like all the millwork in that house. It’s a great stain color too. The blue and green colors you’ve picked out complement it really well. I think one thing that people often miss is picking the right paint colors to bring out the warmth of natural wood, and you’ve done a great job.